Why do some men become convinced—despite what doctors tell them—that their penises have, simply, disappeared. Why do people across the world become convinced that they are cursed to die on a particular date—and then do? Why do people in Malaysia suddenly “run amok”? 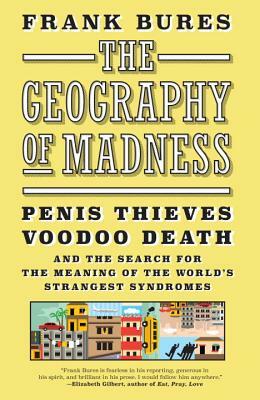 In The Geography of Madness, acclaimed magazine writer Frank Bures investigates these and other “culture-bound” syndromes, tracing each seemingly baffling phenomenon to its source. It’s a fascinating, and at times rollicking, adventure that takes the reader around the world and deep into the oddities of the human psyche. What Bures uncovers along the way is a poignant and stirring story of the persistence of belief, fear, and hope. FRANK BURES's stories have appeared in Harper's, Esquire, Outside, Bicycling, and Wired, and have been included in a number of Best American Travel Writing anthologies. They've also been selected as "Notable" picks for Best American Sports Writing 2012 and the Best American Essays 2013. He lives in Minneapolis.